The original, gentle, all-purpose silver polish. Removes tarnish quickly, leaving a brilliant and even shine. Also works well on stainless steel, porcelain, and chrome...plus many additional uses. Gentle all-purpose silver polish that removes tarnish quickly and leaves a bright, even finish. Also works well on stainless steel, porcelain, and chrome. This product has many additional uses! 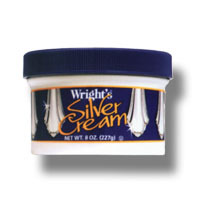 Use Wright's Silver Cream for often used sterling and plate.